Finally got the internet back up and running so here's the latest from Austin. 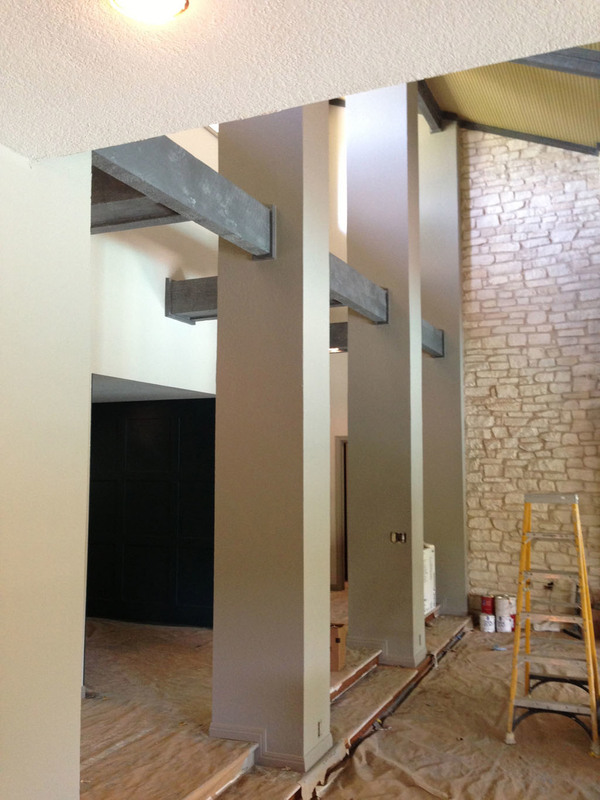 The Living Room ceiling and walls were completed yesterday along with the columns. Due to the terrific amount of work assembling and disassembling the scaffolding to access the highest ceiling in the clerestory, it was a very time consuming project. But worth every minute. It looks great! You can see Jose touching up the golden ceiling while Isaiah was putting the first coat on the upper walls. 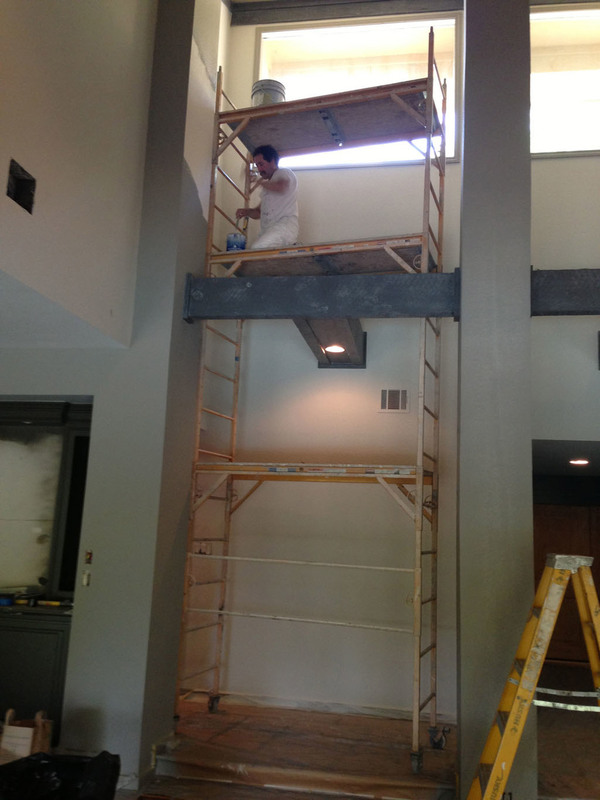 Omar is up high on the scaffolding painting the ceiling and the upper third of the columns. You can see various views below along with a reminder of the color scheme. As the painting in individual rooms is completed (except for any touch-ups) we are finally able to begin removing the paper from the floors. The floor color is totally wrong but it's great to see the paper gone. Doug DeBoe, the owner of the painting company, has arrived to work with Omar on the stenciling and specialty finish on the Kitchen cabinetry. You can see him and Omar removing paper from the Family Room floor and the Entertainment cabinet below. 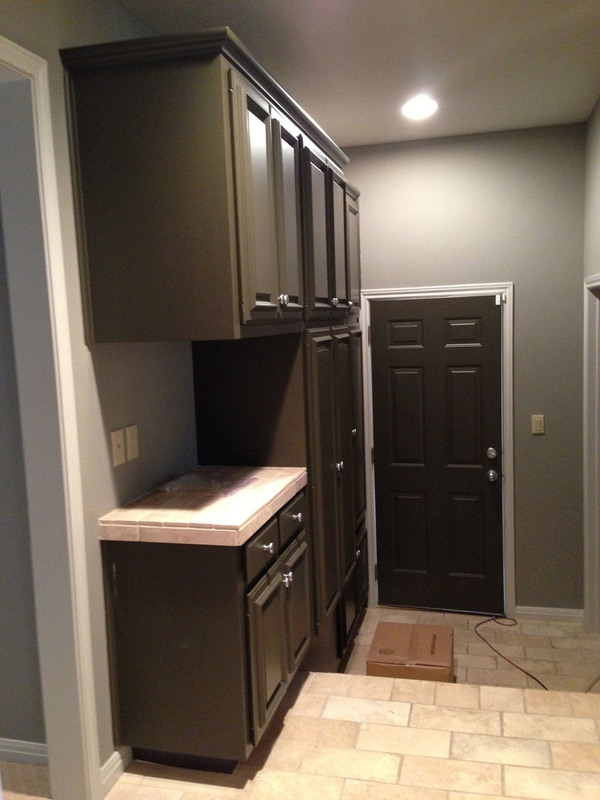 The hardware has also been installed in the West Hall and the West Guest Bath. Of course, these photos are all taken with my iPhone so even though the colors in the Hall and Bath are exactly the same, they look very different. 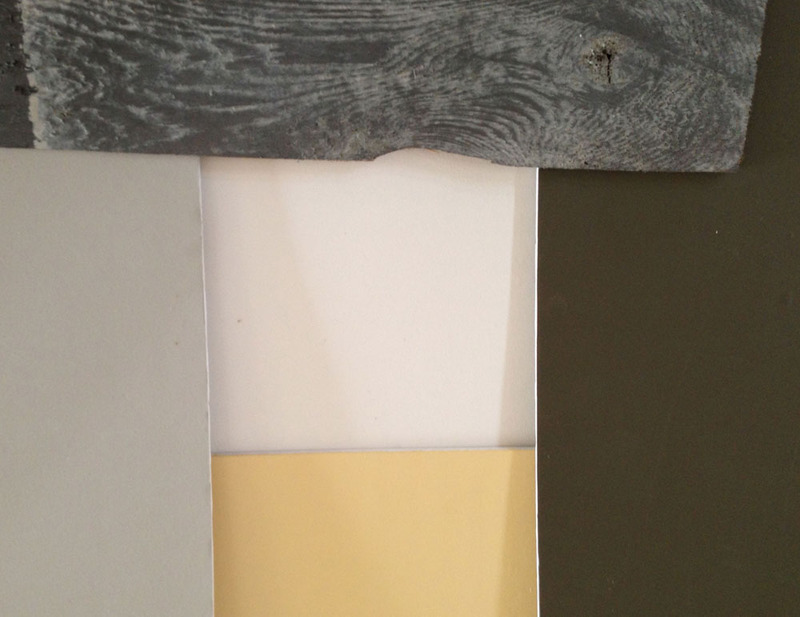 The photo of the Hall is a much closer representation of the colors used. Since most prep is completed, Jose "The Sanding Machine" has become "Tape Man". 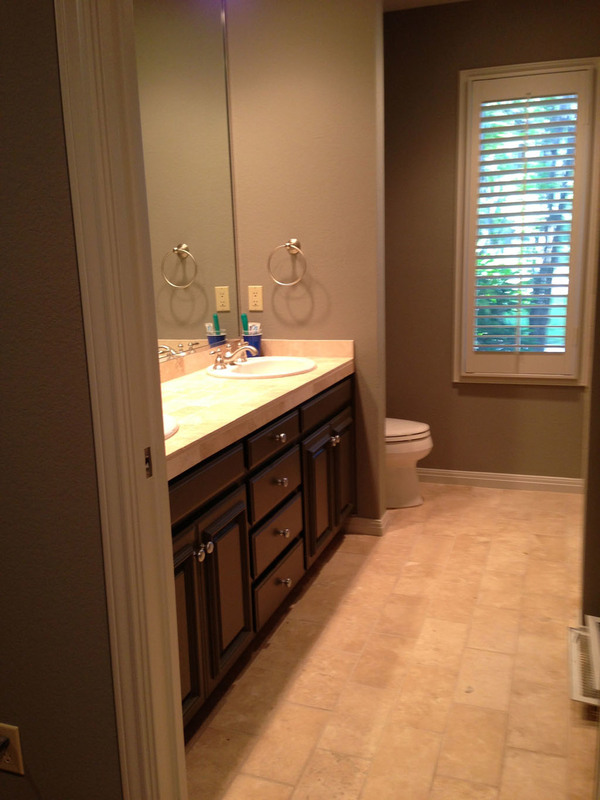 With the high contrast between walls and trim or cabinetry colors, absolutely straight lines are critical. The only way to make this happen is by carefully masking areas off with $6.99 a roll painters tape. The East Guest Bedroom is clearly going to be one of the biggest tape jobs in the house. Today the work repairing all the damaged texture in the skylight shafts was also done. Looking up I pretty clearly heard Tangina Barrons saying "go into the light". Which isn't much of a stretch since these shafts are very, very tall. The primer coats for the wall colors were also painted in the Library and North East Guest Rooms. 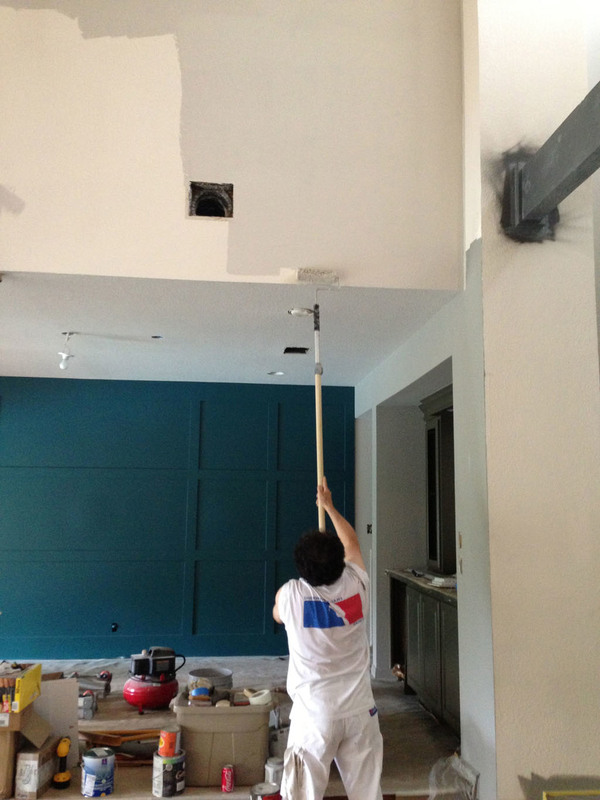 But most exciting is the commencement of the stencil work for the ceiling of the Master Bedroom. You can see Doug and Omar getting the perimeter ready and actually applying the paint below as well as the first row. There is an additional border row that will be inserted between the top treatment and the first row of full sized tiles. This is going to be a knock-out. More Wednesday! Thanks for following along.